In this return engagement, James Reams (“The Kentucky Songbird”) and Walter Hensley (“The Banjo Baron of Baltimore”) offer up, with the able collaboration of Jon (“Baltimore Jonny”) Glik, Mark Farrell and Carl Hayano (gotta get those last two boys some nicknames), a strong hand of songs and tunes, some originals, some traditional, some rare gems and some drawn from unexpected places. Cut in one wild weekend, with all the musicians in the same studio at the same time and not a Pro-Tool in sight. Presented to you with all the edges intact and all the excitement raw. 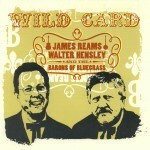 If you’re hungry for bluegrass music with more grit and less glitz, here’s another heaping helping.